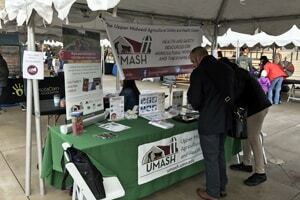 The outreach team represented UMASH at the annual Ag Awareness Day on the University of Minnesota East Bank campus. This was a great opportunity to showcase UMASH to many people who are not aware of the diverse agricultural industry and our particular focus of worker health and safety. We asked visitors to participate in an Agritourism survey to capture the knowledge of this recent trend in agriculture. In addition, Ag Awareness Day allowed us to connect with other exhibitors to build awareness of our center and the many resources we have available to aid in the goal of reducing injuries on the farm.